Back in fall of 1985, Dire Straights’ song “Money For Nothing” was at the top of the Billboard charts, Growing Pains premiered on ABC TV, Sylvester Stallone and Bridgitte Nielson were married, and Ford released its first Mustang with a fuel rail type port injection V8 – the Electronic Fuel Injection (EFI) 5.0 liter HO (which was standard on the 1986 Mustang GT and optional on the 1986 Mustang LX). Dire Straights has been forgotten having been disbanded since 1995. Growing Pains ended its long run in 1992. And Sylvester Stallone and Bridgitte Nielson only lasted two years before a messy divorce. Ironically in fall of 1985 Huey Lewis and the News had a number one hit that littered the airways named “The Power Of Love” which was the main theme from the 1985 hit movie Back to the Future . Which is exactly what happened to the Mustang in Fall of 1985 it went back to the future – today the Mustang is still around 26 years later and just as popular as it was then and it still is equipped (with the GT) with a port injected 5.0 liter V8 – however the current 5.0 is a DOHC V8 versus the old pushrod V8 of 1986 (which really only displaced 4.9 liters but nobody was counting). And for those wondering why this may have been a big event, from 1983 to 1985 the hottest Mustang motor had been the 4-bbl (carburetor) equipped 5.0 liter High Output (HO) V8 (175 horsepower for 1983-1984 and 210 horsepower for 1985). These 5.0 motors in the Mustang GT helped to bring the Mustang back on the path to true performance. 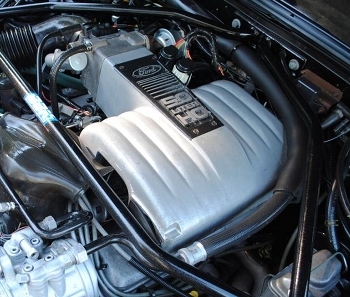 However the legend of the Mustang 5.0 liter (302 CID) HO V8 was built on the port injected EFI 5.0 liter HO. Without the port injected 5.0 HO V8 the Mustang GT would not be the performance car it is today. Ford to its credit had dabbled in fuel injection before the 1986 EFI 5.0 liter HO V8 with the Central Fuel Injection (CFI) 5.0 liter HO V8 which had produced 165 horsepower for 1984 and 180 horsepower for 1985. The CFI 5.0 liter HO when ordered on the Mustang GT an automatic transmission was mandatory – a manual transmission was mandatory with the 2-bbl (1982) and 4-bbl 5.0 HO. The CFI 5.0 HO was a throttle-body fuel injection system which had a throttle-body the size of a 2-bbl carburetor mounted on the top of the intake manifold. The (sequential) port injection 1986 EFI 5.0 liter HO V8 had a fuel rail on each side of the intake manifold – the two rails had a total of eight fuel injectors, one for each cylinder. The new system gave better fuel efficiency since fuel was delivered in a more efficient manner, and it also gave the motor more power potential. The new EFI 5.0 HO had a nice bump up in compression over the previous 4-bbl 5.0 HO from 8.4:1 to 9.2:1. There was also a new true dual exhaust system with four catalytic converters (two per pipe) and a crossover pipe that was standard with this new motor. With all this in mind, horsepower should have risen considerably over the previous year 4-bbl 5.0 HO motor unfortunately the opposite was true, it dropped by 10 to 200 horsepower however torque was up by 15 to 285 lb-ft total. The reason for the drop was Ford pulled a fast one, it put a set of restrictive heads on the motor which were a swirl design – great for emissions but they robbed the 5.0 liter of precious horsepower. The previous 5.0 liter HO motors used a more free-flow wedge head design. Fortunately the swirl heads were a one year only item and for the 1987 model year Ford reverted back to wedge heads and engine output jumped to 225 horsepower and 300 lb-ft of torque. The swirl heads were responsible for the bump in compression and they provided a faster burn rate which improved engine efficiency. Also the 1986 EFI 5.0 HO had a new water pump which taxed the engine less than the previous year water pump. Never-the-less even with the swirl heads the 1986 Mustang GT and the 1986 Mustang LX (when equipped with the EFI 5.0 HO V8) were both fast enough to beat their competition – the 1986 Camaro Iroc-Z and 1986 Pontiac Trans Am. Hot Rod magazine (September 1985 issue) in a comparison test between the 1986 Camaro Iroc-Z and the 5-speed manual transmission equipped 1986 Mustang GT obtained with the GT a 0-60 mph time of 6.0 seconds and a 1/4 mile time of 14.7 seconds at 92 mph. These performance times were not normal mid-1980s performance era times, they were something out of the original muscle car era. The 1986 Mustang GT would give many of the original era muscle a run for their money. It was this 1986 EFI 5.0 HO V8 that forced GM to add the Corvette’s Tuned-Port Injected 350 CID V8 to the Camaro Iroc-Z and Trans Am’s option list for 1987 in order to remain competitive. And let’s also take a step back and look at the 1985 Mustang GT with the 210 horsepower 4-bbl 5.0 liter HO, Motor Trend magazine (October 1984) obtained a 0-60 mph time of 7.08 seconds and a 1/4 mile of 15.51 seconds at 89.7 mph and Car and Driver magazine (January 1985) obtained a 0-60 mph time of 6.4 seconds and a 1/4 mile time of 14.9 seconds. Both of these times were slower than Hot Rod magazine’s test of the 1986 Mustang GT which indicates that its 200 horsepower figure may have been underrated, and may have produced more horsepower than the the 1985 Mustang GT. Never-the-less the 1986 Mustang GT packed enough punch for Hot Rod magazine to easily declare the Mustang GT the victor in the battle. Hot Rod remarked “with many technical improvements for ’86…. the Mustang out-performs the Camaro by a wide margin – and is a serious threat to the Corvette”. In the Hot Rod comparison the 1986 Camaro Iroc-Z was equipped with Chevrolet’s L69 4-bbl 5.0 liter (305 CID) HO V8 rated at 190 horsepower and 240 lb-ft of torque which was equipped with a 5-speed manual transmission. There was a Tuned-Port Injected (TPI) 5.0 liter (305 CID) V8 also on the Iroc-Z option list for 1986, it was also rated at 190 horsepower which was 25 horsepower less than the 1985 TPI 5.0 liter V8 and it could only be equipped with an 4-speed automatic transmission. So the L69 equipped Iroc-Z was the hottest ticket in the Camaro camp for 1986. On paper it made only 10 horsepower less than the 1986 Mustang GT which had a standard 2.73 rear axle ratio and optional 3.08 rear axle ratio versus the L69 Iroc-Z’s more performance oriented 3.73 rear axle ratio. In a perfect world the GT and Iroc-Z should have had equal performance times with the 10 horsepower difference and gear ratio difference canceling each other out. However in the Hot Rod magazine comparison the GT gave the Iroc-Z a serious beating – the Iroc-Z managed a 0-60 mph time of 7.3 seconds and a 1/4 mile time of 15.5 seconds at 87.7 mph. Hurting the Iroc-Z was the 300 extra lbs more it was carrying around versus the very light (3,139-lb curb weight) GT. The performance difference between the two competitors also adds more to the mounting case that the 1986 Mustang GT made more horsepower than Ford advertised. Even putting aside the comparison of the performance figures of the two cars, the Mustang had the advantage of more torque – 45 lb-ft of torque – which made the GT’s engine feel a lot more powerful at the bottom end of the rpm range. In stoplight-to-stoplight type driving Ford’s small-block 5.0 liter HO felt like a larger displacement motor in comparison to the L69. It is lots of low end torque that muscle car fans crave and back in 1986 the Mustang delivered on that front better than the L69. What a difference a few years had made back in late-1983 model year when the L69 motor first appeared in the 1983 Z28 model of the Camaro, it easily made mincemeat out of the 1983-1984 Mustang GT. For 1986 the tables were turned and Ford returned the favor and the L69 was turned into mincemeat. If Chevrolet had carried over to the 1986 Camaro Iroc-Z, the 1985 TPI 5.0 liter V8 with 215 horsepower and 275 lb-ft of torque which was only available with a 4-speed automatic, it would have been a more closer match to the 1986 Mustang GT in fact some magazine tests obtained similar 1/4 mile times and 0-60 mph times a few tenths of a second slower with the TPI equipped 1985 Iroc-Z when compared to the 1986 Mustang GT’s performance times. The one advantage of the 1986 TPI 5.0 liter V8 versus the 1985 was torque had increased to 285 lb-ft. Unfortunately the TPI 5.0 liter V8 as mentioned previously was detuned for 1986 to 190 horsepower and there was no manual transmission option for 1986. It’s easy to see why GM was forced to offer the Corvette’s TPI 5.7 liter (350 CID) V8 in the Camaro and Firebird lineup for 1987 in order to remain competitive. Unfortunately the TPI 5.7 V8 would also only be available with a 4-speed automatic. Ford didn’t play around with the Mustang GT every year from 1982 – the first year of the return of the Mustang GT which had been on hiatus since 1969 – it had a standard manual transmission for its hottest motor every single model year. 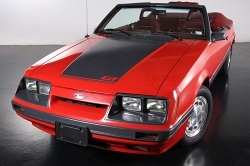 What was different about 1986 was the Mustang GT was its hottest motor could now be ordered in either an automatic (4-speed automatic) or with a manual transmission – the Borg-Warner T5. For 1982, 1984, and 1985 the Mustang GT offered inferior performance motors for those who wanted an automatic transmission, for 1983 there wasn’t even an automatic transmission offered. One area that the Mustang had lagged behind the Camaro and Firebird during the early 1980s was in the handling department. Ever since the third generation Camaro/Firebird was released in 1982, the Mustang GT had found itself at a terrible disadvantage when it came to handling and braking. For 1986 the gap had narrowed in terms of handling Hot Rod magazine obtained .82 g on the skidpad test which was leagues better than a few years before. Hot Rod had for the same test obtained .86 g on the skidpad for the 1986 Iroc-Z (it mentioned .84 in the body of the magazine article but listed .86 in the spec sheet) which was one of the best handling cars in the world at the time. The Mustang GT’s improved handling suspension had been available since 1985 and included 15×7 inch wheels with P225/60VR-15 Goodyear Eagle Gatorback performance tires. The Iroc-Z had wider wheels and tires and a lower center of gravity so the Mustang GT’s close showing shows how hard Ford engineers had worked to narrow the gap. Unfortunately the same could not be said about the Mustang’s braking which had mandatory rear drum brakes – it took a much longer distance to stop than the four-wheel disc brake equipped Iroc-Z. And even though the Mustang GT since then has remained a hot performance package, it would not be until 1994 when it would get rear disc brakes. Another Achilles’ heel of the Mustang GT of this era were the 4-lug wheels – something you would expect on an economy car not a performance car – they were also finally replaced with 5-lug wheels for 1994. 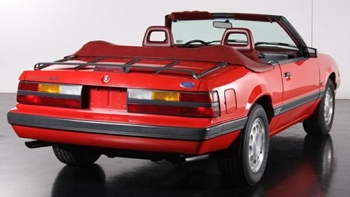 The 1986 Mustang was the eighth model year of the Fox-platform Mustang which had originally been released for 1979. The Fox-platform Mustang proved to have longevity it last fifteen full model years until it was replaced by an all-new 1994 Mustang. One of the reasons for the success of the Fox Mustang was Ford did a good job of updating the exterior and interior every few years which kept the Mustang current and attractive to buyers. The styling of the 1986 Mustang GT was attractive yet also muscular – there was no denying upon first look that this was a performance car. The 1986 Mustang GT exterior was a carryover from the 1985 Mustang GT which had a new front-end design when compared to the 1984 Mustang GT. This front-end design with quad headlights reflected the popular aero look at the time also found on other Ford cars such as the Thunderbird. 1986 was the first year for the federally mandated high mount third brake light. Ford did it right by adding the brake light to the GT’s rear spoiler (or rear trunk rack if it was a convertible) where it didn’t affect the smooth styling of the GT – Chevrolet did it wrong on the 1986 Camaro by adding the brake light to the top of the rear hatch in a new large bump which made it stick out like a sore thumb. 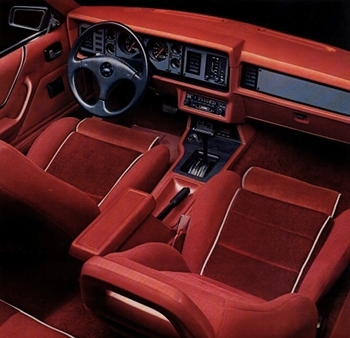 The 1986 GT’s interior was also a carryover from the previous year. Ford had done an excellent job of keeping the dash and interior current. The gauge layout did not look dated and it was easy to read all the gauges. The standard three spoke steering wheel was sporty and well placed – this steering wheel was replaced with a two spoke steering wheel when cruise control was ordered. The seating position was higher than the Camaro and Firebird which allowed for better visibility out the windshield and other windows. The GT interior had very comfortable front articulated cloth seats with plenty of adjustments. The interior had a much more finished and upscale look than earlier Fox Mustangs. Comparing this interior to the most upscale 1979 Mustang interior was like comparing a Hilton hotel to a Red Roof Inn. The Mustang GT could be equipped with many interior luxury options. Ford also offered different open air options on the Mustang GT, there was an optional removable sunroof and removable T-top roof panels. However if that was not enough there was a Mustang GT convertible model. The Mustang GT convertible had the added bonus of having optional leather seats – it was the only Mustang GT model to have this option. To prove that Ford was delivering the goods to its customers with the 1986 Mustang, it sold an astounding 224,410 units – of these 50,465 (40,578 hatchbacks and 9,887 convertibles) were GT models. The GT had a low base price of $11,102 ($14,945 for convertible) which offered more bang for the buck than any other performance car (only exception was the 5.0 liter Mustang LX). This was how the Mustang GT did business back in the 1980s. The 1986 was the first port type fuel injected Mustang GT, it’s the car the current 412 horsepower 2012 Mustang GT traces its roots directly back to. As previously mentioned, Huey Lewis and the News’ song “The Power Of Love” which was a big sensation when the 1986 Mustang GT was first released, proclaimed “the power of love is a curious thing – make a one man weep, make another man sing”. Back in 1986 the Mustang GT dominated in its performance class so much so the Mustang GT owner was the one singing and the Camaro Iroc-Z owner was the one weeping.